Sorry for the silence of the last few days, but we've been crazy-busy since my return from Portland. There are a lot of things occupying our plate during this our busy season, not least of which is moving cattle around. We're still in the grip of a nasty month-long heat wave with temps in the mid- to high-nineties. I know folks in the southwest consider that a cold snap, but we're not used to it up here just a couple hours from the Canadian border. None of us do well in heat -- that's why we're not living in Phoenix or something -- so we've been suffering through (without air conditioning, of course) as best we can. We've been vigilant about the comfort of the cattle, of course. I don't think it's humane to let animals bake in unrelenting sun with no shade if there are alternatives available. So depending on the temperature, we've been shuffling the beasties between the pasture (no shade) and the woods (shaded but not as much food) as needs be. Yesterday we decided it was time to move them onto a neighboring 20 acres we lease during the late summer and early fall. This property has abundant trees, fresh grazing, and a pond -- so we call it "the pond property." But first we needed to put some animals in with Samson, our bull, for breeding. This required me to figure out who was already bred, who was due to give birth, who was too young to breed, and other particulars. We don't like to breed heifers until they're about 15 months old, which means they'll birth their first calf at the mature age of two. We decided we would put in Victoria and her yearling heifer calf Rosy, and pretty little Dusty. The two young ladies are now old enough to breed, having been born last May. It was an easy matter to call all the critters into the feed lot (adjacent to the bull pen) with our universal cattle call of "Bossy bossy bossy bossy BOSSY!!" Before letting anyone loose, of course, we closed the driveway gate, just in case... though it was unlikely anyone would wander in that direction. Then we starting cutting out animals one by one. They knew where to go, and obediently trotted to the pasture gate... though, I might add, without much enthusiasm. After all, it's hot, and the pasture is pretty much eaten down. They fanned out, picking dutifully at the short grass. Samson was having the time of his life, sniffing all the girls' butts. 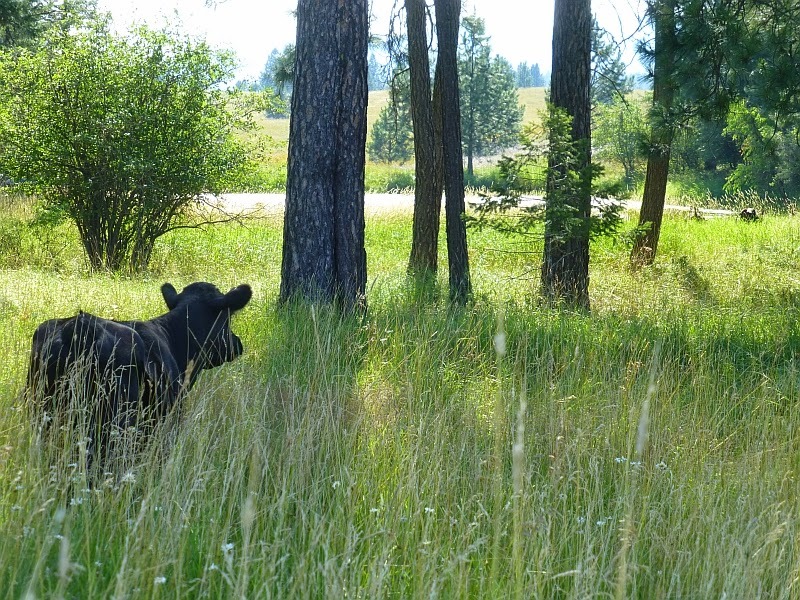 Meanwhile Don and I didn't say a word to the rest of the cattle, but we quietly started walking to the bottom of the pasture to open the gate to the pond property. It didn't take long for the critters to catch on to what we were doing. ...quietly at first, then with increasing enthusiasm. The older animals knew precisely what was up. The younger ones just followed along. Soon, in their enthusiasm, they got ahead of Don and me. The babies, Chuck and Lucy, didn't know what was going on, but the enthusiasm of the herd was catching and they dashed around playing tag, despite the heat. "C'mon!! Open the gate already!" They settled right away into bovine bliss. Fresh food, lots of shade, plenty of water... not much more a cow could ask for! An hour or so later, I went to check up on the critters in the feedlot. Samson was still sniffing bottoms. Bulls routinely do what's called a Flehmen response, which allows them to test for the presence of pheromones to determine whether a female is in heat. That's what Samson did the blessed day long with his new harem. Cows cycle about ever 21 days, but the very presence of a bull may trigger a cycle sooner. These ladies will be bred within a month at most (it's best to keep a cow with a bull for two cycles, just to make sure a breeding "takes"). Meanwhile I saw an opportunity to shoo Raven out of the feedlot. She went into the pasture with very little trouble. Trouble was, she didn't know where everyone else was. For two or three hours she grazed by her lonely self in the hot baking sun. Finally I took pity on her, went into the pasture, and started walking down toward the pond property. I called very softly, "Bossy bossy bossy!" and she fell right in line behind me. Within a couple of minutes, she was through the gate. I walked her to where the other animals were blissfully grazing in the shade. She was very happy to rejoin her herd-mates after a six-week stint in the bull pen! Little Alice came bouncing right over to say hi. ...I turned and noticed this ominous smoke to the south. I immediately called the Fire Department to see if this was a controlled burn (in this heat? not likely!) or a wildfire. It was the latter, and the hard-working firefighters had it subdued within an hour or so. It started from a lightening strike from a thunderstorm that rolled through night before last. Scary moment! We live in north central OK and know what wildfires are like. No fun. We have had them within a mile of our place. Scary! Thankful for the firefighters!! Glad you're ok.
My goodness, that fire is a little too close for comfort! I think I can even see flames! I always love me some happy cow stories with visual exhibits. Thanks for the little getaway. Sorry it's so hot. I hate hot weather, too, but the work doesn't end because it's hot. There's only so much a body can take. So happy the fire south of you guys was contained quickly! Bless those wonderful firefighters. Patrice, I love your photo essays! I'm old as the hills but never had the chance to learn about cows, calves and bulls so up close and personal. It's wonderful! I love the scenery! So beautiful and well maintained! We've had the coolest July and August in years here in Central Texas! The heat is on it's way, tho. I am forever thankful for air conditioning. thankful that the fire was contained, and blessed by cow pictures...can I come play? Here in Northern MN, (2 hours from Canada), we have actually had a wonderfully cooler summer, and only 3 days so far in the 90's. It goes too quickly, and we have to embrace what we get! Thank you for your pictorial...love it!